For business or pleasure, when in Sharm El Sheikh book your stay at the fabulous Renaissance Golden View Beach Resort Hotel. 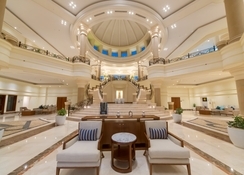 This brand new 5 star resort is located at Om El Seid, nestled on a headland peninsula overlooking the spectacular coral reefs of the Red Sea and Ras Mohamed National Marine Park. Just 5 minutes from the old town of Sharm El Sheikh, the areas diving marina and the chic nightspots of Naama Bay with it's varied selection of bars, restaurants, cafes, bazaars and nightclubs, the Renaissance Golden View Beach Resort Hotel exceeds all expectations! 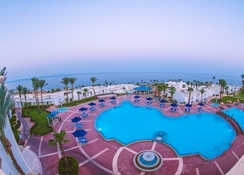 Sharm El Sheikh International Airport is 18 km from the hotel. Local Tips: The small Tiran Island is a marvellous area for snorkelling. The island itself does not have much more than sand, but the surrounding waters are filled with terrific reef in shallow waters. Boat rides to the island usually stop at two other reef shelves before arriving at the island for lunch. The Renaissance Golden View Beach Resort Hotel offers beautifully maintained gardens and luxurious accommodation for an unforgettable holiday. Food, drink and entertainment: Coast International Main Restaurant is open for breakfast, lunch and dinner with an international buffet featuring an open display kitchen. 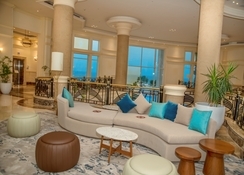 There are two a la carte restaurants specialising in Mexican and Italian cuisine, cafe bar and lounge with small meals and snacks, pool bar, panoramic cocktail bar, lobby bar, lounge with live music. For Winter 2012 mid day snacks, afternoon snacks and ice cream will be served as part of the all inclusive package in Acapalco Joe's bar/restaurant and the Aqua bar. 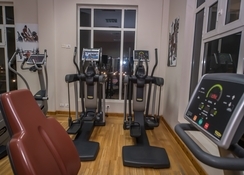 Sports, games and activities: Four swimming pools, Jacuzzi/ whirlpool, beach access, Oasis Health Club, sauna, massage, squash, tennis court, table tennis, billiards, SCUBA diving, snorkelling, volleyball and water-sports. Childrens club and playground. 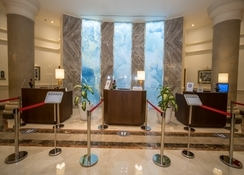 Additional: 24-hour reception, ATM, currency exchange, safety deposit boxes, shopping arcade, supermarket, 3 meeting rooms, and high-speed Internet access (with charge), free shuttle bus to Naama Bay. 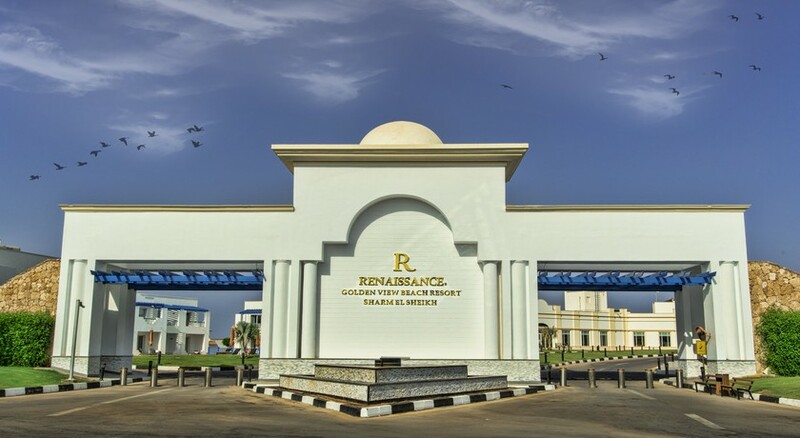 The Renaissance Golden View Beach Resort Hotel features 272 guest rooms and 112 suites, all with en suite bathroom, air-conditioning, Satellite TV, mini-bar, telephone, safe, pull-out sofa, rollaway bed and balcony or terrace. The accommodation comprises a series of two storey villas. Most rooms and suites enjoy views of the Red Sea. Family suites are available with a stocked kitchenette (upon request). Cots available free of charge (on request). This property is not recommended for wheelchair users. High Speed Wi-Fi ChargeUSD 02.00 per room per day for unlimiteddevices access.